Crown above V above W Germany on cute lady in shorts figurine:- Could also be described as "W crown 1764". My grandmother had this figurine and I always liked it as a child. I have no idea where my grandmother got it. She was an avid garage saler, so my guess is that where she managed to find it. When she passed away 15 years ago, I acquired the figurine. Unfortunately there is only a trademark and it doesn't tell you who manufacturer is. I tried to look it up in some books at our local library but couldn't find anything. So finally I thought that I would try the internet. I have searched the image of the mark as well as the statue on google in images, but nothing came up. I tried this forum as well but couldn't find anything. It is a very modern type figurine for how old I think the item is. It looked more American to me because of the outfit the girl is wearing, I am not sure exactly where she is supposed to be going, it is like she is going to the beach but her shoes and purse suggest that she is going out on the town. just would like to find out some more history about it. If I can maybe found out who the artist was that made it that would be great as well. Any assistance I can get will be greatly appreciated. We don't normally post up anonymous submissions here as this is above all a friendly person-to-person community. However, this post is so peachy for so many reasons, I just couldn't delete it. 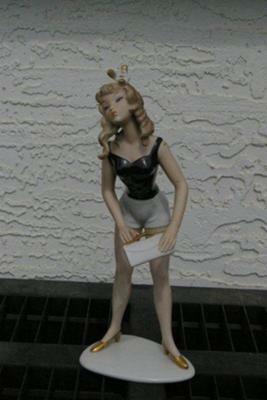 First, the figurine itself is totally lovely and so 1950's vintage look. Second, this is a good maker whose mark is not easy to identify from the backstamp, so therefore many people will be searching for the answer. The company is Wallendorf, a German maker also known as Schaubach Kunst Lichte-Wallendorf. The plant was a very early one founded in 1763 or 1764 under the name of Hamann & Greiner. Later names were Hamann, then Hutschenreuther & Kieser, then Kämpfe & Heubach, then Kämpfe & Sontag, then Kämpfe & Heubach, then Fraureuth, Niederlassung Wallendorf, then Schaubach-Kunst. Your W mark (looks a bit like a small v above a W or two overlapping V's) was used by the company from the 1950's. 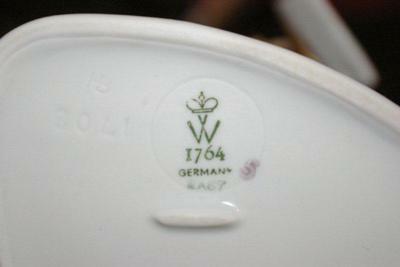 In 1990, the company was re-named Wallendorf Porcelain and as far as I know continues to this day using modern variations of their standard 'W' crown mark.